Long gone are the days when fashion and workout wear existed in separate worlds. Today, thanks to the introduction of a little thing we like to call athleisure, the two can coexist peacefully — and stylishly. In fact, some of the biggest names in fashion have started to find their own happy place between high fashion and high pulse rates as they’ve put their stamp on the genre by partnering with some of the world’s biggest sports brands — Nike, Reebok, and Puma, we’re looking at you. 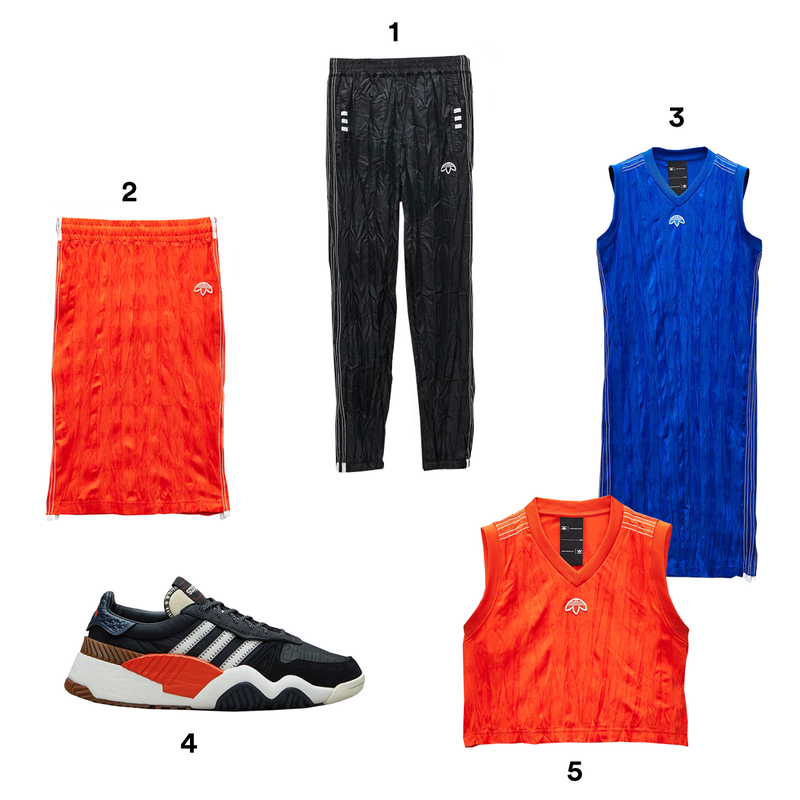 To help you navigate this space and bring a little fashion to the gym (or some serious comfort and mobility to your fashion), we’ve rounded up some of the season’s hottest athleisure collaborations, all available at Simon Shopping Destinations. So scroll on and pick your faves, all without breaking a sweat. The German performance company gets some serious NYC street cred thanks to this collab with one of the hottest names in fashion. The traditional three-stripe design has been reimagined for oversized silhouettes, while the traditional footwear gets a bold injection of colour and pattern. And true to his subversive nature, Wang has literally turned the brand upside down by inverting the trefoil logo on each his designs. 1) ALEXANDER WANG X ADIDAS ORIGINALS Adibreak Pants, available at Adidas. 2) ALEXANDER WANG X ADIDAS ORIGINALS Red Skirt, available at Adidas. 3) ALEXANDER WANG X ADIDAS ORIGINALS Blue Tank Dress, available at Adidas. 4) ALEXANDER WANG X ADIDAS ORIGINALS Run Mid Shoes, available at Adidas. 5) ALEXANDER WANG X ADIDAS ORIGINALS Red Crop Jersey, available at Adidas. The sports performance powerhouse has enjoyed an injection of fashion-forward thinking thanks to trailblazing designer Matthew Williams. This is sportswear for the computer age, as Williams fused form with function by using Nike’s plethora of data on athletes alongside his own computational algorithms for design. The resulting pieces feature modular layers, magnetic buckles, and smart storage, whether you’re on a run or just on the run. 1) NIKE X MATTHEW WILLIAMS Black Full Zip Hoodie, available at Nordstrom. 2) NIKE X MATTHEW WILLIAMS Black Tight Leggings, available at Nordstrom. 3) NIKE X MATTHEW WILLIAMS Black Lounge Pants, available at Nordstrom. 4) NIKE X MATTHEW WILLIAMS Medium Support Dri-Fit Sports Bra, available at Nordstrom. 5) NIKE X MATTHEW WILLIAMS Black Tank, available at Nordstrom. While these fashionable sippers aren’t technically athleisure wear, they were too chic not to include here. The designer who has come to symbolize all things prep has applied some of her favourite prints to these super-practical and eco-friendly water bottles. And bonus: she has also released flip-flops, visors, and other accessories in these same prints to ensure that you’re coordinated when lounging poolside or on your way to the gym. 1) LILLY PULITZER Catch the Wave Swell Bottle. 2) LILLY PULITZER In the Groves Swell Bottle. 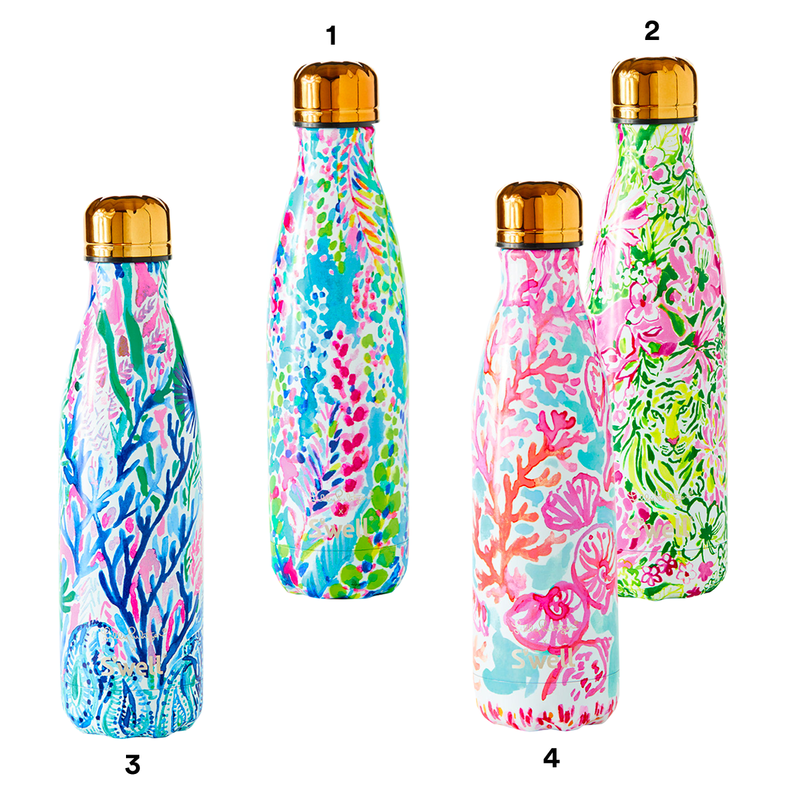 3) LILLY PULITZER Race to the Wave Swell Bottle. 4) LILLY PULITZER Shell We Dance Swell Bottle. How often do you hear the names Victoria Beckham and Shaquille O’Neal in the same sentence? Thanks to Reebok, it’s about to happen a lot more often! When the ersatz Posh Spice was asked to design a collection for the sports brand, her mind only went to one place. “When I think of Reebok, I think of the ‘90s and basketball — and therefore of course I think of Shaq!” she says. “For me this capsule really represents a celebration of that era, of Reebok and Shaq’s shared history in basketball.” His iconic dunk has been applied to various sporty pieces, all available now. 1) REEBOK X VICTORIA BECKHAM Unisex O’Neal Black and Red Hoodie, available at Reebok. 2) REEBOK X VICTORIA BECKHAM White O’Neal Tee, available at Reebok. 3) REEBOK X VICTORIA BECKHAM Black and White O’Neal Socks, available at Reebok. 4) REEBOK X VICTORIA BECKHAM Black O’Neal Tee, available at Reebok. 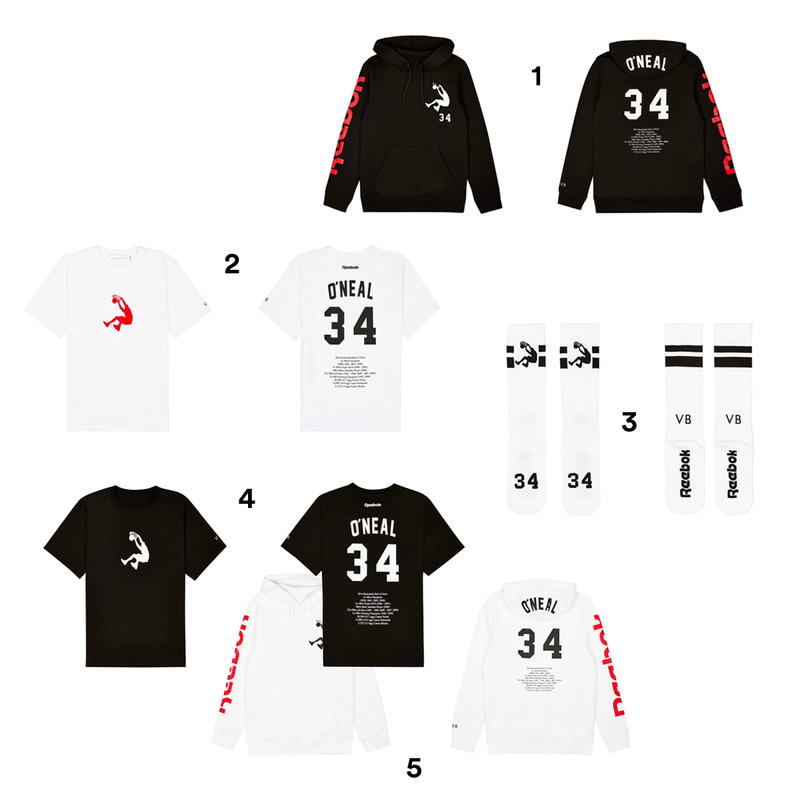 5) REEBOK X VICTORIA BECKHAM Unisex O’Neal White and Red Hoodie, available at Reebok. When creative director Alessandro Michele took over the reins at Gucci, he quickly became known for sporting his beloved Yankees ball cap. As happens in the world of fashion, the opportunity for collaboration did not go overlooked, and now we’re talking about the newly launched collab between the Italian fashion house and Major League Baseball. Sporting logos from teams like the Pittsburgh Pirates and San Francisco Giants in addition to the Yankees, there’s never been a more stylish way to root, root, root for the home team! 1) GUCCI X MLB Leather Slippers with SF Giants Patch, available at Gucci. 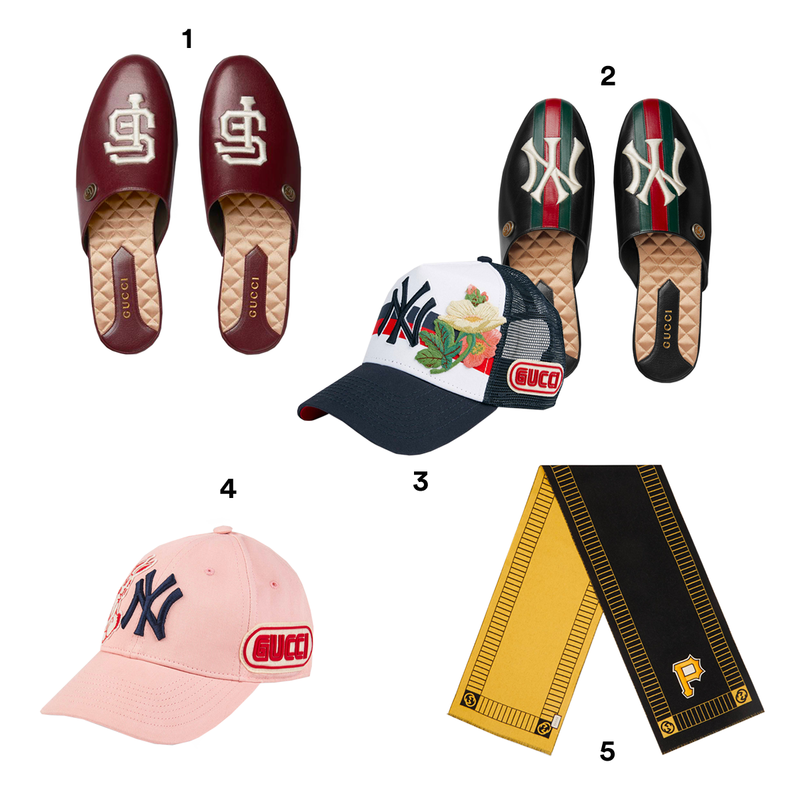 2) GUCCI X MLB Leather Slippers with NY Yankees Patch, available at Gucci. 3) GUCCI X MLB Black & White Baseball Cap with NY Yankees Patch, available at Gucci. 4) GUCCI X MLB Pink Baseball Cap with NY Yankees Patch, available at Gucci. 5) GUCCI X MLB Wool Scarf with Pittsburgh Pirates Patch, available at Gucci. Converse and JW Anderson exist at opposite ends of the fashion spectrum, but it’s the space between one’s forward-thinking designs and the other’s iconic, made-for-everyone sneakers that creates the driving force behind this collaboration. Style and culture converge in these edgy-yet-sporty sneaks. 1) JW ANDERSON X CONVERSE White Logo Grid, available at Converse. 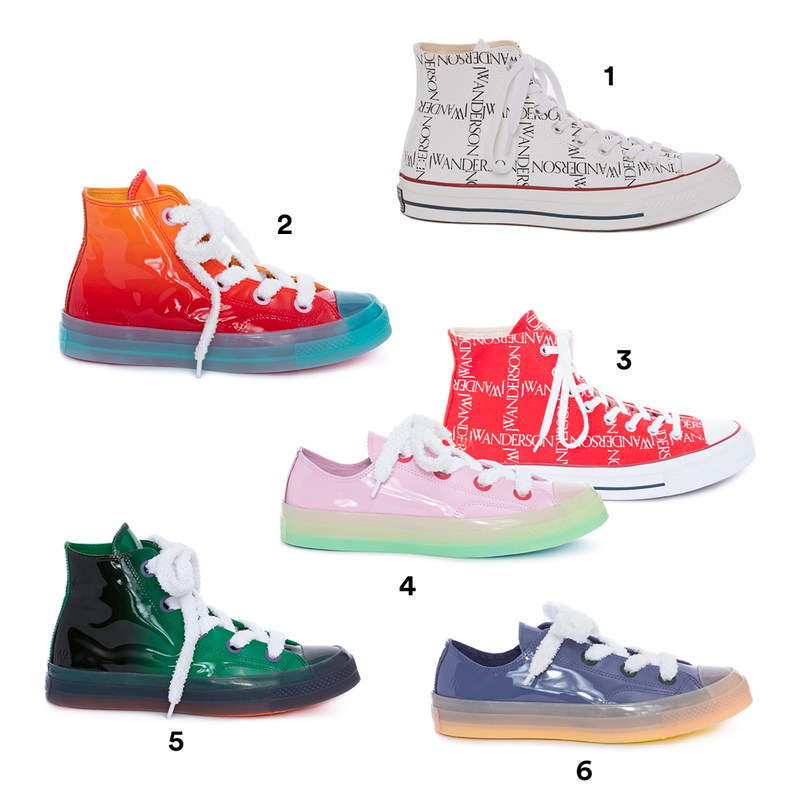 2) JW ANDERSON X CONVERSE Fire Patent High Tops, available at Converse. 3) JW ANDERSON X CONVERSE Red Logo Grid, available at Converse. 4) JW ANDERSON X CONVERSE Light Pink Patent Low Tops, available at Converse. 5) JW ANDERSON X CONVERSE Green Patent High Tops, available at Converse. 6) JW ANDERSON X CONVERSE Mauve Patent Low Tops, available at Converse. Tomas Maier rose to the top echelons of fashion when he put Bottega Veneta on the map as the brand’s creative director for 17 years, all before launching his own eponymous line. For his collection in collaboration with Uniqlo, he’s taken that sense of refinement and craftsmanship and made it available to everyone via these swimming and swimming-inspired pieces. 1) UNIQLO X TOMAS MAIER Palm-Print Stole, available at Uniqlo. 2) UNIQLO X TOMAS MAIER Printed Swim Triangle Bikini, available at Uniqlo. 3) UNIQLO X TOMAS MAIER Chino Wide Shorts, available at Uniqlo. 4) UNIQLO X TOMAS MAIER Printed Short-Sleeve Tee Dress, available at Uniqlo. 5) UNIQLO X TOMAS MAIER Printed Long-Sleeve Rash Guard, available at Uniqlo. 6) UNIQLO X TOMAS MAIER Airism Pile Lounge Long-Sleeve Hoodie, available at Uniqlo. Inspired by the early days of hip-hop, Puma and MCM come together for a limited-edition collection that champions streetwear essentials with an athletic edge. 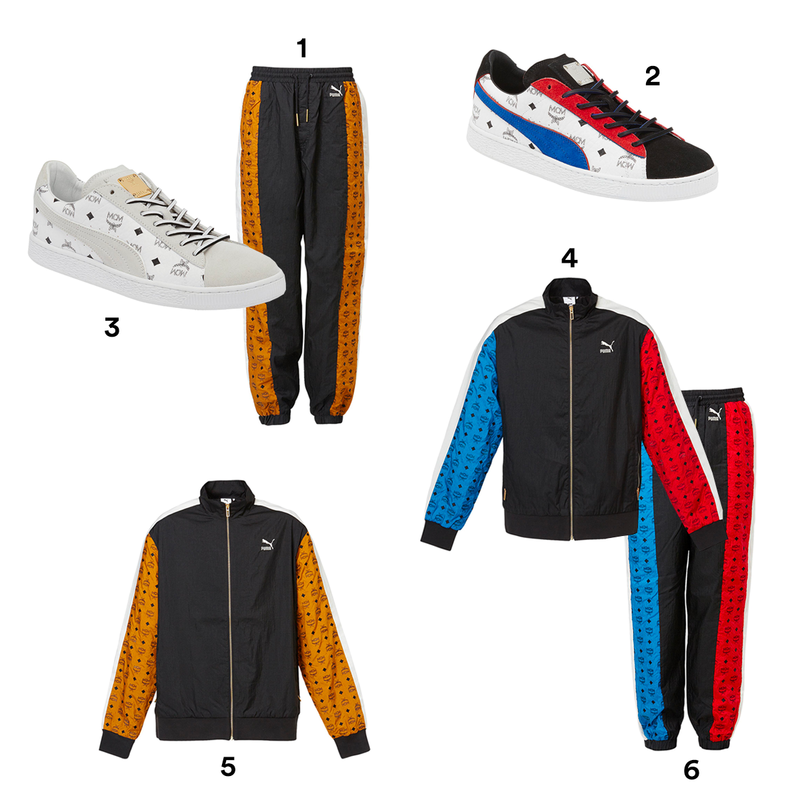 Think ‘90s tracksuits and classic Puma silhouettes, all adorned with MCM’s iconic monogram and stripes. 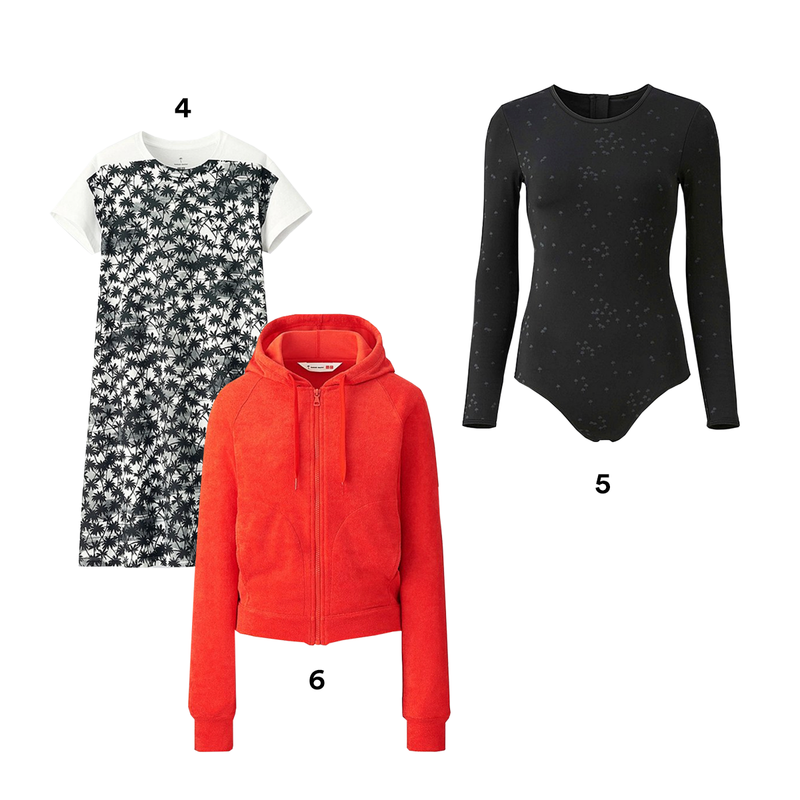 It’s a collection that will make you want to jump(suit) for joy! 1) PUMA X MCM Tan and Black Hip-Hop Track Pants, available at Puma. 2) PUMA X MCM Red White and Blue Suede Classic Sneakers, available at Puma. 3) PUMA X MCM White Suede Classic Sneakers, available at Puma. 4) PUMA X MCM T7 Red White and Blue Track Jacket, available at Puma. 5) PUMA X MCM T7 Black and Tan Track Jacket, available at Puma. 6) PUMA X MCM Red White and Blue Track Pants, available at Puma.